Paper curl analysis technology makes it possible to predict paper curl generated on MFPs or printers. To improve high quality printing and adaptability to varied paper types, we have clarified the mechanism that generates paper curl. Electro photographic copiers and printers put images on paper by transferring toners (resin particles) to paper using static electricity. The system comprises a fuser assembly that heats this toner image to melt and adhere toner to the paper. The fuser heats the paper instantaneously at high temperature (at least 100°C) for about 0.05 seconds. Paper curl occurs, depending on heating conditions at the time or the environment, and where the paper was kept before use. Because paper curl deteriorates printing quality or causes paper jams, defining the curling originating mechanism and creating countermeasures against it have been desired. But because the paper is heated during transport and the paper properties themselves depend on the temperature-humidity environment and paper brand, clarification of the mechanism has been difficult. 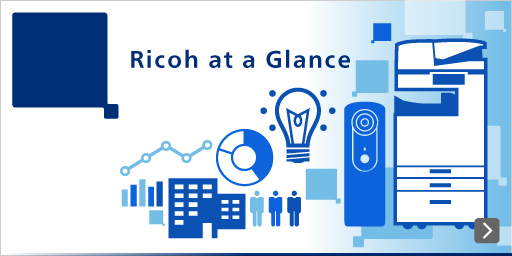 With that background, Ricoh focused on the heat difference between the front and reverse sides of the paper among several causes of curling origination and clarified the curling originating mechanism based on the temperature difference; this had gone undefined until then. By predicting curl based on this mechanism, we can design a fuser to suppress curling origination to the minimum. This also enables a stable paper path with fewer paper jams. Figure 1 shows how the paper is heated by the fuser and how paper curl is generated. The fuser comprises a fusing roller to melt the toner on the image surface side and a pressing roller to press paper on the fusing roller. Temperature of the fusing roller incorporating a heater (heat source) becomes high, whereas the pressing roller becomes cooler than the fusing roller, also to save energy. When considering the mechanism that generates the paper curl, because the more the moisture evaporates, the more the paper shrinks, it was predicted that the fusing-roller side shrinks more as the temperature is high, making it easier for moisture to evaporate. As a result, paper tends to curl toward that side. In reality, however, the paper curls toward the pressing-roller side, where the temperature is low. To clarify this phenomenon, we conducted tests to measure the humidity of both sides (the front and reverse side) of paper immediately after heating in both cases, where both sides of the paper are heated at the same temperature and at a different temperature. When there is a difference in temperature, humidity of the paper becomes higher on the low-temperature side than on the high-temperature side. The test showed that when heating creates a difference in temperature, moisture travels in the thickness direction of the paper from the high-temperature side to the low-temperature side, and moisture content of the paper on the low temperature side rises. 1) Moisture travels from the high-temperature side to the low-temperature side, in the thickness direction of paper. 2) The moisture content of the paper on the low temperature side rises. 3) The moisture evaporates more on the low-temperature side after heating. 4) Because paper shrinks more as the moisture evaporates, paper on the low-temperature side shrinks more than the high-temperature side. 5) Curl headed for the low-temperature side is formed. To predict paper curl, we must seek for moisture travel within the paper in the thickness direction as shown at 1) and 2) of Figure 2. 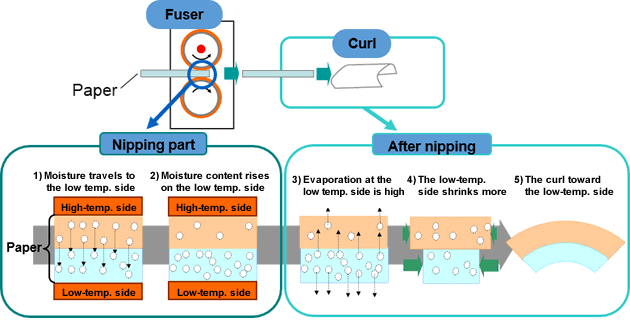 Assuming the paper to be porous media like a sponge, we analyzed the moisture travel based on the water-vapor-pressure difference inside the paper, and moisture diffusion, taking into account temperature at the time of fusing and paper properties. From this analysis result, we can predict paper curl at the time of heating. Having conducted a verification experiment, we confirmed validity of the analysis formula to calculate this moisture travel. *In analyzing moisture travel, we obtained the technical assistance of Professor Takaharu Tsuruta and Associate Professor Hirofumi Tanigawa of Kyushu Institute of Technology, Japan. *Contents on this moisture travel analysis and its verification won the excellent discourse thesis prize of the IIP (Information, Intelligence, and Precision Equipment Division) at the annual-conference discourse, in fiscal year 2013 of The Japan Society of Mechanical Engineers. If prediction of paper curl becomes possible, we can design a nipping part (part to nip paper between fusing roller and pressing roller) to warp paper in a direction to outweigh curling, for example, to suppress generation of paper curl in the fuser to the minimum. Further, although curling differs depending upon the sort (brand, thickness, size) of paper, heating temperature, and temperature difference, if the amount of paper curl on each condition is predicted and the paper path is designed taking that amount of paper curl into account, it will lead to stable paper transport with fewer paper jams and to improved adaptability to varied paper types. Beyond that, prediction of paper curl in assessment at the design phase can narrow the sort and environment of the paper to use for assessment, making efficient assessment possible. Paper curl analysis technology contributes to providing reliable MFPs and printers and to efficient design and development. Sorted by : field "Printing" | product type "Multifunction Products"